Examine.com is now 5 years old. What started off as a personal project has, with your feedback, evolved into something _far_ greater. Five years ago, the quality of information out there on supplementation was abysmal. Our original motivation to improve this situation was simple and selfish: We wanted to know which bodybuilding supplements actually worked. So we looked at the most popular ones — creatine (works), glutamine (does not work to build muscle), tribulus (does not boost testosterone), and more. And as people started to hear about our unbiased approach, we expanded — first into major supplements (starting with fish oil and vitamin D), then into nutrition myths (e.g. MSG is bad for you, top 10 nutrition myths), and finally into in-depth analyzes of nutritional research (the Examine.com Research Digest). It was obvious we had hit on something people wanted. There was a need for in-depth analyses of current research by professionals who could both make sense of new studies and make them accessible to different levels of readership — from Jane and John Doe, to the enthusiasts, to health professionals. Any time you want to know what this or that supplement does, we have your back — just as you have ours. For if we had to pick the one thing we’ve loved most over the past 5 years, it would be the amazing support we’ve received. People like you have not only kept us on our toes, you’ve been our evangelists with the masses, and you’ve helped guide our evolution from the start. Within the past 5 years, we’ve had over 25,000,000 visitors. Currently, we have over 50,000 visitors every day. On average, each visitor spends almost 2 minutes on the site. That equates to over 100,000 minutes per day. Within a month, that’s over 2,000 days of pure reading time spent on Examine.com. 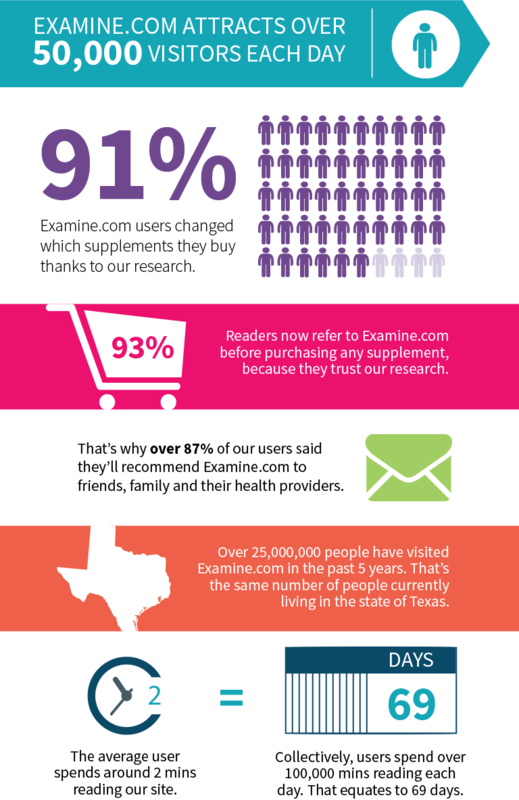 Google Consumer Surveys indicate that 13% of supplement buyers know Examine.com. This may not sound like a lot, but it means that more than 1 in 10 people will seek our advice on supplementation. Considering that the supplement industry is worth over $10 billion dollars in North America alone, that’s a serious impact! Furthermore, from surveys we sent to our 150,000 Examine.com Insiders, we learned that 93% consult our site before purchasing a supplement. Not only that, but 91% have changed their buying habits because of our research, and 87% would recommend Examine.com to health professionals. But what are all those people coming for? The entire site has over 3,500,000 words and 50,000 references. Our two biggest pages are the ones on fish oil and creatine, each of which has over 60,000 words and 700 references. 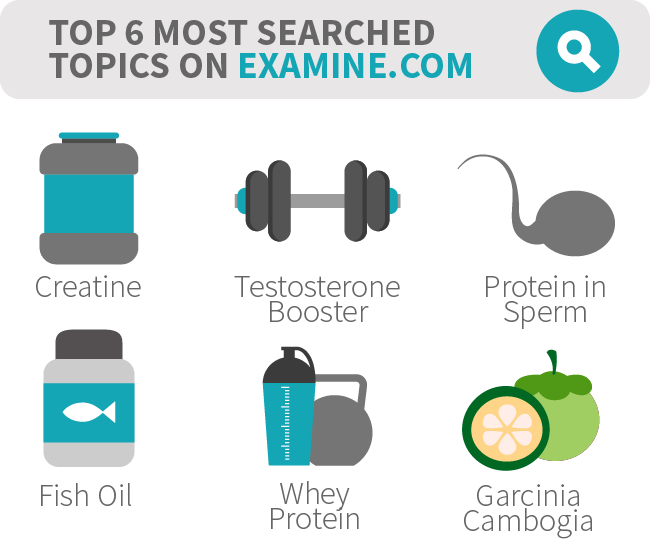 Among the supplements listed in the above infographic, it is garcinia cambogia that enjoyed the sharpest spike of interest. Why? Dr. Oz. That shows you the power of the media … and how important Examine.com has become in the battle against misinformation. Every day, our site performs over 10,000 searches. What’s kind of cool is that when people make one query, they tend to make at least five more. It seems that once people start tapping into our unbiased source, they cannot get enough! Once people start searching for information on Examine.com, on average they make at least 5 more searches. As we celebrate our 5-year anniversary, we’re already looking forward to the next 5 years. Our goal is to have at least 100,000 visitors per day within the next 2 years, which should allow us to make a big dent in the amount of misinformation out there. As a company, in order to remain 100% independent, we accept no advertiser, sponsor, donor, or consulting client, nor do we sell any supplement. We exist only thanks to you.